When this article went to print, athletes training for Lake Tahoe’s first Ironman Triathlon had 26 weeks until race day. While that may seem a long time, it’s nothing compared to the training schedule prescribed to take on such a challenging feat of human endurance. The Ironman Lake Tahoe will push athletes from around the world on a grueling 2.4-mile swim, 112-mile bike and 26.2-mile run course throughout North Lake Tahoe. For some, it’s not nearly the hardest Tahoe has to offer. Conners-Pace, a certified Level 1 USA Triathlon Coach who offers sports performance testing, coaching consulting and training through Tahoe Peak Endurance, LLC, explains tough in Lake Tahoe means something different to every athlete, big and small, young and old. 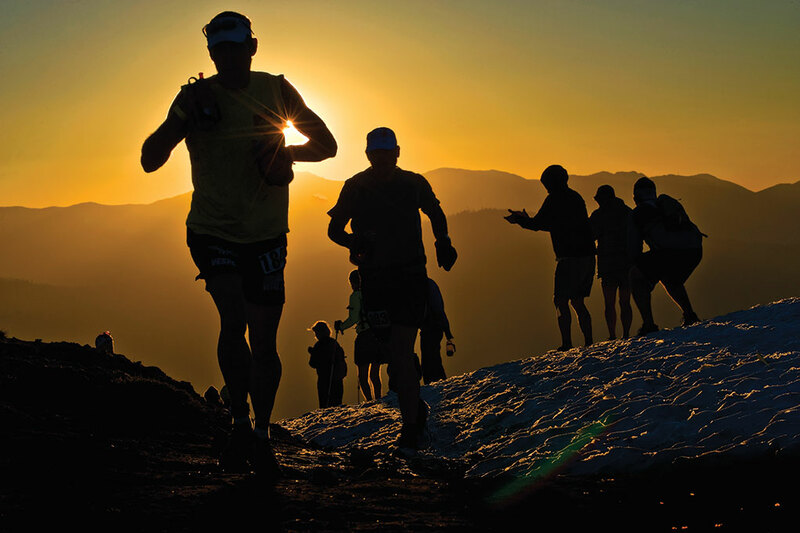 The Western States 100-mile Endurance Run is the world’s oldest and most prestigious 100-mile trail race and takes place every year in late June. Other demanding runs, Conners-Pace adds, are the 50-kilometer, 50-mile and 100-mile Tahoe Rim Trail Endurance Runs, which take runners to a high point of 9,214 feet on the Tahoe Rim Trail; and the Squaw Valley, Northstar California and Heavenly Mountain Runs, all of which climb several thousand feet up Tahoe’s legendary ski resorts during the summer months. The XTERRA Lake Tahoe and XTERRA Tahoe City off-road triathlons push athletes with a 1,500-meter swim in Lake Tahoe, a 22-mile mountain bike course on some of the region’s toughest trails and 6 miles of trail running. Incline Village’s Rob Laurie, who completed the 22-mile solo Tahoe swim crossing in 2012 and raced in the XTERRA World Off-Road Triathlon Championships in Hawaii and XTERRA National Championships in Odgen, Utah, says by far one of the most arduous local races is the Big Blue 24- and 36-hour Adventure Race. The multi-day race includes more than 15 miles of kayaking on Lake Tahoe, 60 miles of mountain biking, 18 miles of foot travel and advanced orienteering, and challenges athletes on all levels, says race organizer Todd Jackson. Jackson’s Big Blue Adventure production company provides more than 25 human-powered events in Tahoe each year, including the Tahoe Trail Running Series, the Donner Lake Triathlon, Lake Tahoe Triathlon and Tahoe’s XTERRA off-road triathlons. One of the strictly enforced rules during the 36-hour Big Blue Adventure Race is teams are not allowed outside assistance. That includes use of GPS devices, cell phones or access to water and feed stations. Teams must be totally self-sufficient for the entire race. Another multi-day favorite of many Tahoe and Reno locals is the Reno-Tahoe Odyssey (RTO). If you’ve got a team of friends, a few support vehicles and a Friday and Saturday to spare, the 12-leg relay, 178-mile RTO takes teams from downtown Reno, up the Truckee River to the shores of Lake Tahoe and over Kingsbury Grade before circling back to Reno via Genoa and Virginia City. One of the toughest winter events in the Tahoe region is the Great Ski Race, which began in 1976 to raise money for the Tahoe Nordic Search & Rescue Team. The 30-kilometer cross-country ski race begins in Tahoe City, climbs Starratt Pass and heads down into historic Truckee along Sawtooth Ridge. Every March, more than 750 Nordic ski racers gather at the start, some in costumes and some in professional race gear, to see who can make it Truckee the fastest. This past year, for example, a particularly challenging, drizzly day meant a combination of ice and slush at the finish line’s steep descent, which resulted in some rough falls. The top racers completed in just over an hour and a half, the final finishers at about six hours. For the team of friends and athletes who want a British Special Forces kind of gnarly, there’s only one option in Tahoe—Tough Mudder. The 10- to 12-mile obstacle course challenge has risen in popularity since its inception in 2010 and, unlike Tahoe’s scenic trail runs or mountain bike races, the Tough Mudder event asks participants to climb, jump, run and crawl on a custom-designed course, which often includes waist-deep mud, barbed wire and electroshock therapy obstacles. Only about 78 percent of competitors finish and the first-aid stations see injuries from broken bones to gashes to heart attacks, yet the race continues to grow as participants test their endurance and ability to weather both fear and pain. Northstar California will host Tough Mudder Tahoe on July 13 and 14 after hosting it in 2012. Another Tahoe Tough Mudder is planned for September 28 and 29, but a location hadn’t been announced as of press time.